You are here: Home / Apps / How An App Is Made, Part 3 – MailDeck’s Launch! How An App Is Made, Part 3 – MailDeck’s Launch! MailDeck lets you view your Inbox as tiles, in cover flow format, or a standard list. It’s been a long journey, but the day has arrived. MailDeck hits the App Store today! In this special final part of our series on “How an App Is Made,” we take an up-close look at the final leg of the process: submission and publication. Catch up on Parts One and Two of “How An App is Made” here: Part One | Part Two. For the conclusion, I sat down with Crono Inc.’s co-founder and CEO, Stephen Weigel for a wrap-up Q&A. We discussed finishing up work on the app, the process of submitting it to Apple for approval into the App Store, and the company’s future plans. Robin: Congratulations on finishing MailDeck! I’ve been using it for a few days, and I’m very impressed with it so far. Now that it’s done, how does one submit an app to Apple? Stephen: Well, as we’ve discussed before, you have to sign up with Apple as a developer in order to submit apps to the App Store. Once you have completed development and testing, you provide Apple with the final binary as well as several other items through their developer portal, iTunes Connect. One of the most important items besides the app itself is the App Store description. You’re required to submit a description of your app that’s not to exceed 4,000 characters, describing the functions and features, in-app purchases available, and any other information that you want to include to set your app apart from the others. MailDeck fundamentally changes how you organize and use the data, images, and contact info in the emails you receive. I hear lots of stories about apps that fail to meet Apple’s standards. What sorts of checks and balances does Apple have in place to keep that to a minimum? Apple does a very good job of providing developers with a wealth of information related to everything from best coding practices, submission tips, App Store marketing guidelines, requirements for asset sizes, guides for adding/editing/deleting apps, as well as setting up your financial information and much more. Also, if you are ever unsure about anything, you can always reach out to Apple for help. And if they find something wrong…? They reject your submission. If that happens, Apple provides you with a general idea as to why it was rejected and gives you the opportunity to fix the errors — whether it’s related to the code, or the marketing materials and assets you’ve provided. Once you’ve corrected the errors, you use the same process as you did with the initial submission. How do you find out if your app has been cleared for publication? Apple keeps you updated on every step of the review process with email notifications. Also, you can check the status of the submission within iTunes Connect. If you’re like us, chances are that you are compulsively checking both until you get approved! Once the app’s been approved, your app is ready for sale and will hit the App Store on the date that you chose when you submitted for review. Do they flip the final switch to make it live, or do you get to do that? The decision to go live on the App Store is at your discretion. Prior to submitting the app, you select a date in the future for releasing it. In order to align the timing of the release with your marketing efforts, you’re able to change the release date once approved. Search your inbox using filters smarter and more intuitive than those on your laptop. If Apple chooses to highlight your app as an “Editor’s Choice” or “Best New App,” do you get advance notice of that? Or do you find out when the rest of the world does? You’re notified ahead of the rest of the world if you’re selected. Since Apple is showcasing your product in a more prominent location on the App Store, you have to provide them with additional assets that can be used there, including large and small banners. So now you’ve published at last! What happens next? Everyone knows to expect updates that address bug fixes and compatibility issues. Aside from that sort of thing, do you have plans for future updates? Will you be adding new features to the app on a regular basis? 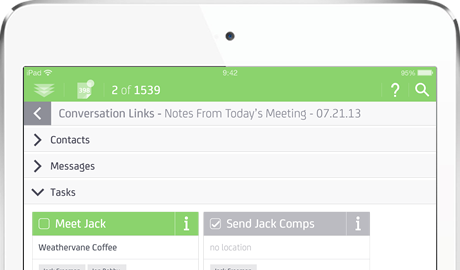 We do have plans for future updates and do plan to add new features on a regular basis. The first such update will be the addition of Exchange compatibility. That will be available through an in-app subscription. There are some other minor features we left out just before launch that we’ll be adding on. Also, in the not too distant future, we’ll be releasing an iPhone version to accompany the iPad version. Email can be improved upon in countless ways and we’re excited to venture beyond the basic foundation and into working on new concepts, while of course ensuring that new features don’t interfere with the intuitive feel of the application. How will you monetize MailDeck? Are you charging for it, or will it be a free download that serves ads? 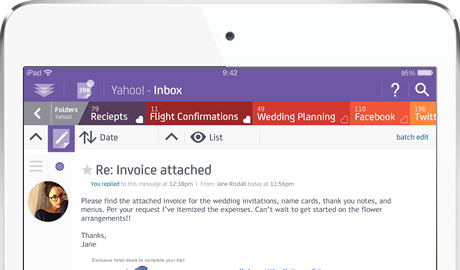 Important items like receipts and flight confirmations will never be lost again, thanks to MailDeck’s smart folders that automatically sort your incoming mail. That’s an interesting approach. Alright, this is it — the moment of truth. I’m a potential customer; hit me with you 30-second pitch for MailDeck. Why is it a better option for me over other popular mail apps like Mailbox, Sparrow, or Molto? 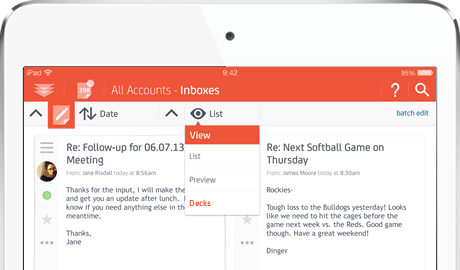 MailDeck is, at its core, a better way to email on your iPad. We feel that the email apps currently on the market sacrifice either an intuitive interface or advanced functionality; sometimes it’s both. MailDeck is not only aesthetically superior and more intuitive, but also offers features that are unmatched even in the desktop realm. 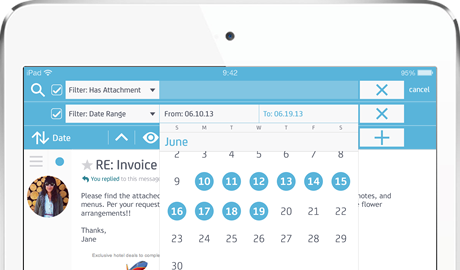 Whether it’s how the app creates a separate attachments folder to take actions on incoming and outgoing attachments, how users can search for a needle in a haystack with any or all of 11 different filters, or how it aggregates associated contacts, messages, tasks, and attachments on one screen with a single tap, the experience is second to none. MailDeck is bold, colorful, and feature-rich. A very big thanks to Stephen Weigel, Jack Freeman, and the rest of the MailDeck team for all their time, patience, and attention to detail in working with us on this series!